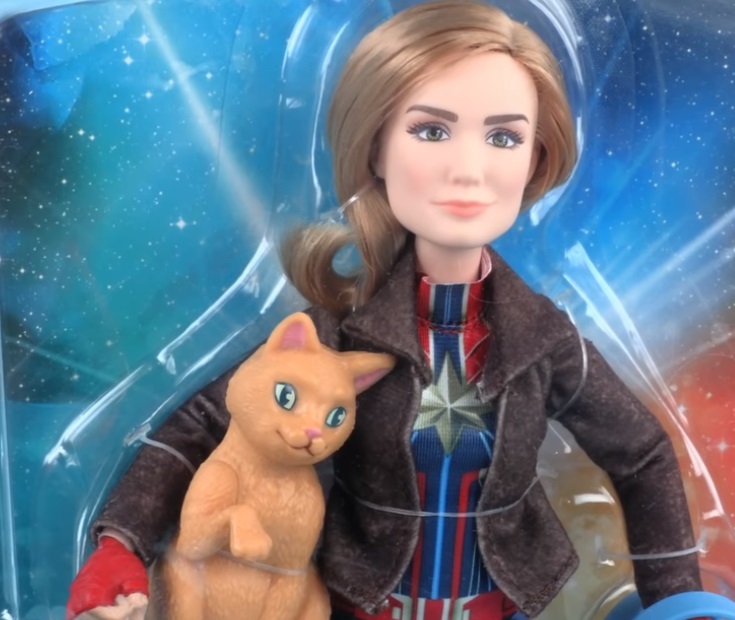 Captain Marvel Doll Review From Hasbro! Good Quality Toys! 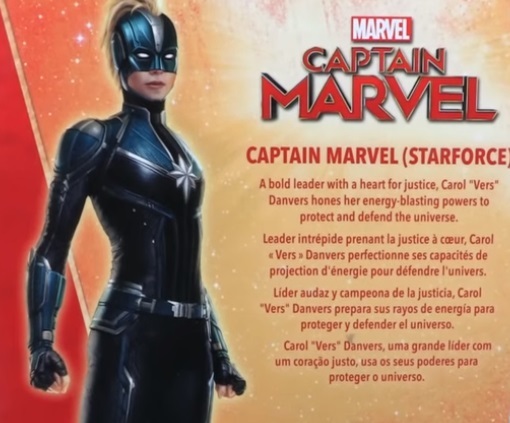 With the release of Captain Marvel coming up on March 8, 2019, I decided to take a look at two of the action dolls based on the Carol Danvers-centric film. 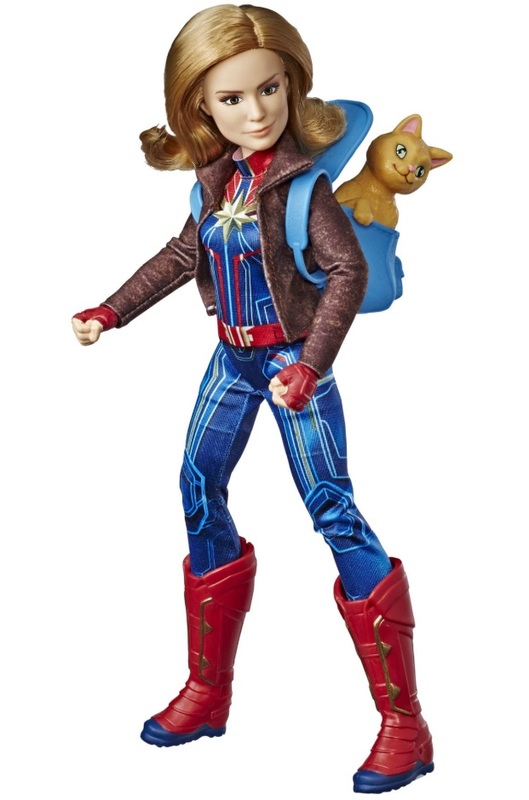 Captain Marvel (Starforce) Doll with Helmet and the Captain Marvel Doll and Marvel’s Goose from Hasbro are quite affordable toys for Marvel fans. 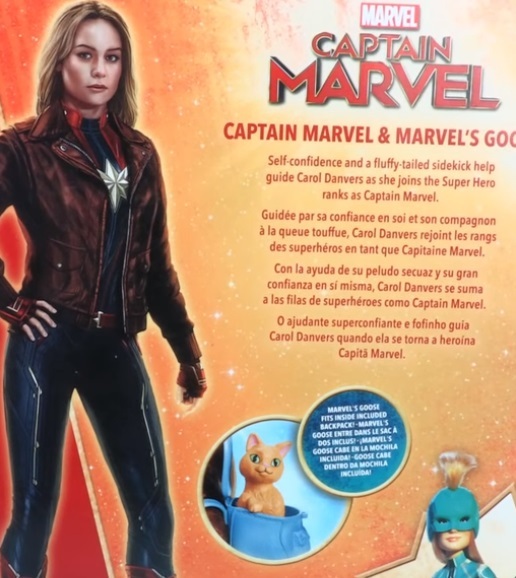 Let’s start with Captain Marvel Doll and Marvel’s Goose because it comes with a cat! The packaging is standard. Out of the box, Carol Danvers stands around 11.5-inches tall. 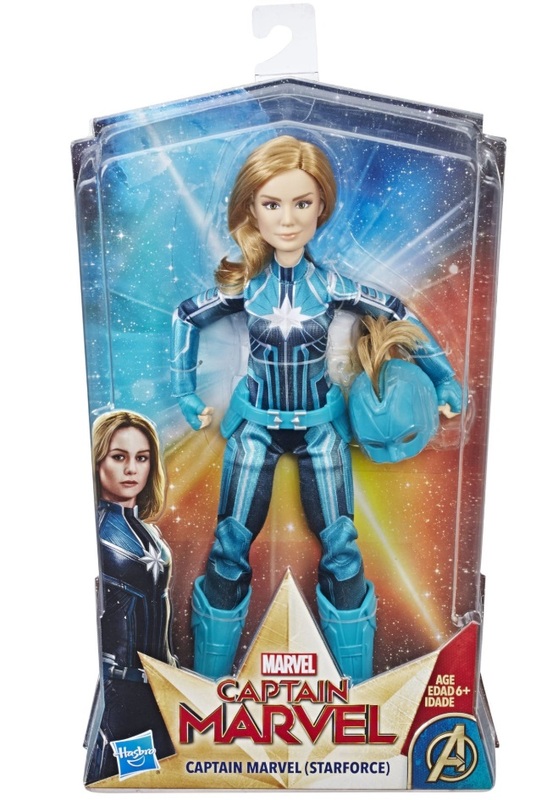 The face sculpt does seem a bit big for her body’s proportions, but it does look like Brie Larson. So, that is a plus. Also, she stands very well, which is another big plus considering how tough it can be to balance dolls. The hair has a nice feel to it. The brown jacket can be removed, but you will need to remove her hands to do so. The uniform is a one-piece with printed details. There is velcro in the back if you want to take the uniform off. The gloves are sculpted on the hands (fists). You can take off the boots to reveal feet which have a slight incline, allowing you to put on heeled shoes if you like. The overall quality is good. She doesn’t feel cheap or delicate. The doll has articulation at the head, shoulders, elbows, wrists, hips, upper thigh, and (double-jointed) knees. 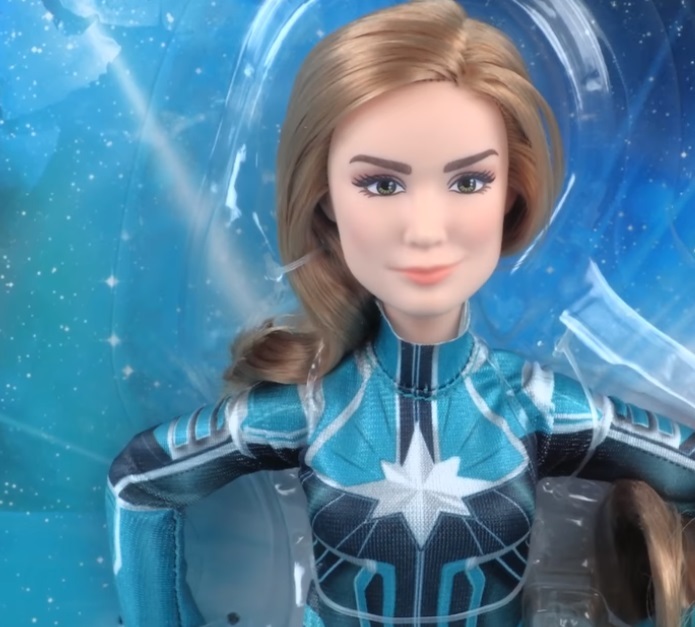 She does look like a doll from the Marvel Rising line (also from Hasbro). Goose is around 3-inches (in a sitting position) with no articulation. I was expecting one of its paws to move, but oh well. The surface is textured to resemble fur. The accessory is a blue backpack (plastic) with a printed texture. The top opens so Goose can sit inside. 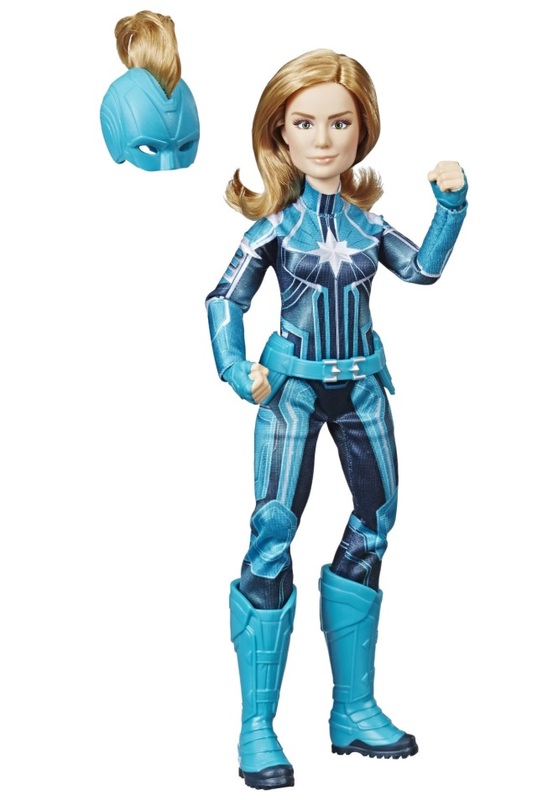 As for Captain Marvel (Starforce) Doll with Helmet, the uniform is very similar to the other doll. The boots have the same sculpt. She is wearing a plastic utility belt, though. The overall body and the articulation are the same, too, including the sculpted fists. The accessory is a helmet with a mohawk. It fits on her head quite well. However, unlike how she appears in the movie, some of her hair does show from the bottom of the helmet. My only gripe with both dolls is that Hasbro should have given us some options instead of offering action dolls with hands stuck as fists. Perhaps a pair of hands which can be used to hold something? But having said that, these are two good-looking Captain Marvel action dolls. 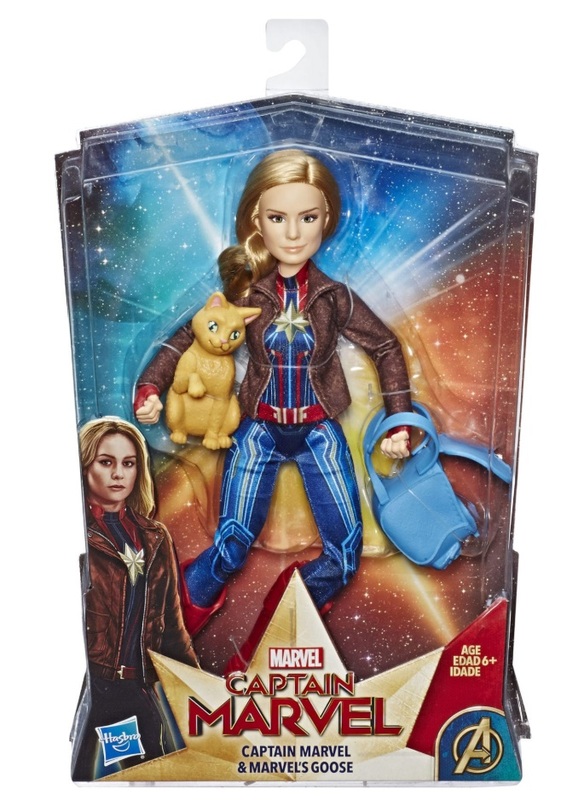 There are also other toys and collectibles in the Captain Marvel line if you are interested. Previous:“Rehtona” Lunching On Steam This January! Lets You Alternate Between Two Parallel Universes!